This will download and install xcode developer tools and fix the problem. You do not need Xcode, you can install only the Command Line Tools here, it is about 130Mb. The problem is that one needs to explicitly agree to the license agreement. As a follow on step, you may need to reset the path to Xcode if you have several versions or want the command line tools to run without Xcode. I found the solution in this question, Command Line Tools not working. You may get an error message: "Can't install the software because it is not currently available from the Software Update server". In this case xcode-select --reset works as pointed by akozin. 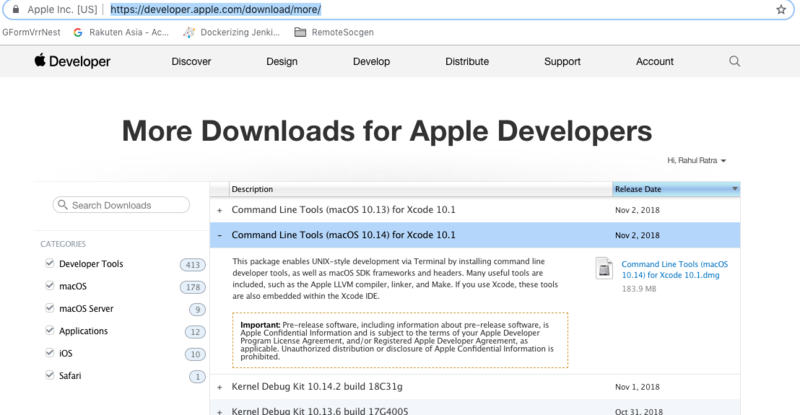 Go to https://developer.apple.com/download/more/ and find Command line tools OS X 10.11) for Xcode 7.1. Then install downloaded .dmg package. It should work with newer versions of Command line tools OS X however I tested it Command line tools OS X 10.11) for Xcode 7.1 particular version. After updating do macOS 10.13, I had to install Command Line Tools (macOS 10.13) for Xcode 9 - also works great. Also installs only command line tools for Xcode. I am leaving my answer in case you'd have problems with installation via cli. and everything will get back to work. Next I needed to upgrade xcode tools to the latest version: sudo softwareupdate -ia --verbose (NB: this runs all available updates from the app store, there is a way to specify that you only want to update one app/program, but I don't know it off the top of my head). You can try this command another time if it shows some inconsistent behaviour during the first try. Finally verify that it worked by using a git command of your choosing, e.g. git status. I tried the xcode-select --install but I was forced to install it from the App Store. Then all git stuff ran smoothly. The accepted answer is correct, but also note that git does not make it obvious if the error is coming from remote or from local. If you are running OS X on your remote, your install problem may be on the remote side and you'll see the same error on git clone and git pull but NOT on git status. xcode-select --install and xcode-select --reset didn't work for me. Choose the Command line of your current OS. Not the answer you're looking for? Browse other questions tagged sierra xcode development git mojave . How do I uninstall the command line tools for Xcode? How to fix git path after MacOS Sierra update? Cannot launch gitk on Mojave: mapped file has no cdhash?